Watching the Northern Lights from your family’s very own glass-topped igloo? Yes, that really is possible. Magical. It’s really the best word to describe a stay at Kakslauttanen Arctic Resort. My family and I spent Christmas at this bucket list property, located in the Lapland region of northern Finland. Yes, that’s inside the Arctic Circle! And yes, it’s frigid (more on that to come). This is not a family vacation that you should undertake lightly. In retrospect, there are a few things that I wish I would have known… and now, you will. The best news? Some of the issues that we had have now been addressed through thoughtful additions to the newer of Kakslauttanen’s two properties, meaning there’s no better time to plan your Arctic vacation! Need further inspiration? Watch a video here. Kakslauttanen Arctic Resort is actually made up of two separate properties within a few miles of each other, something that’s not entirely clear on the resort’s website. East Village is the original site. It offers cabins, two-person glass igloos, and two-person snow igloos (Don’t even think about those; they’re much too cold!). A cozy lodge houses the reception desk, restaurant, and small shop. West Village is newer, shinier, and boasts more amenities, including Santa’s house. In addition to cabins and small igloos, it has four-person igloos and newly-built Kelo-glass igloos. Because we booked late (in September for a Christmas stay), we ended up in East Village. We wanted the experience of staying in a glass-topped igloo, but because only the smaller ones were available and because there’s a three-night minimum during the holidays, we ended up with both an igloo and a cabin… and a lot of added expense. That’s why the new Kelo-glass igloos in West Village are a complete game changer! You get to enjoy the coziness of a wooden cabin with a stone fireplace and Finnish sauna, plus a kitchenette and bunkbeds along with the igloo bedroom that accommodates two additional people for a total capacity of six. Trust me when I say that this is where your family wants to stay! KidTripster Tip: Plan ahead. 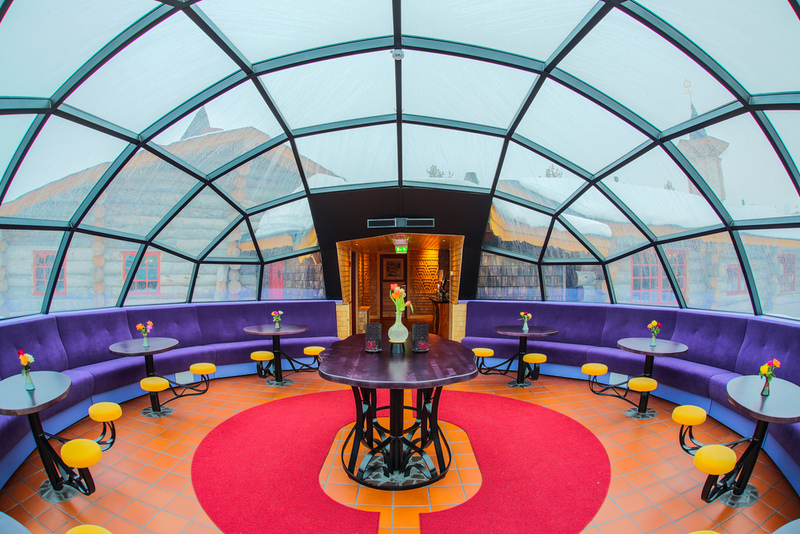 Because the Kelo-glass igloos are so ideal, everyone is going to want them. If you can, book a year ahead. KidTripster Tip: While novel, the full glass igloos do have a downside; they are absolute fish bowls with your neighbor in his fishbowl just a few yards away. Only the base is covered, so everything from the waist up is visible to the outside world, even in the bathroom! KidTripster Tip: Bring your own hair conditioner and lotion. The resort doesn’t supply any, and the air is extremely dry. In addition to the private in-cabin saunas, there’s a smoking sauna and ice swimming. Needless to say, I didn’t try ice swimming first hand. Let’s talk about the weather. During our stay, it averaged around -22° F; that’s insanely cold. It’s so cold that when you step outside, the mucus in your nose crystallizes. We dressed in four layers with the top layer being the warmest winter jacket that we could buy. We brought hand and feet warmers. Even so, when we participated in any activities (dog sledding, snowmobile riding, ice fishing), the tour operators would provide us with a snowsuit to put on top of our layers. It was hardly enough. Other than activities - which last anywhere from one to four hours - my snow-loving sons could only play outside for 20 minutes at a time. Same goes for the cross-country skiing, so it’s really not worth the cost of rentals. KidTripster Tip: It’s very difficult to keep your hands and feet warm. Invest in the warmest pair of gloves and boots that you possibly can, no matter how expensive. In fact, mittens may work better, so that your fingers are not separated. We opted for the half-board option (breakfast and dinner), as there’s really nowhere else to dine; lunch can be purchased, but choices are limited. I was looking forward to trying Finnish dishes, like reindeer, but its preparation was awful. By our fourth night, the kids opted for chicken nuggets. (There are kid-friendly options, but they’re unadvertised.) My vegetarian husband had the same three options everyday, none of which were particularly good. And drinks, even soda, cost extra. The Christmas Eve buffet, which is mandatory and features more Finnish specialities, was better. However, the new dining options in West Village seem more promising. The surroundings are stunning with stone fireplaces and wood carvings. Plus, there’s an Igloo Bar, where you can sip cocktails and potentially enjoy the Northern Lights from inside. Since we’d come all the way to the Arctic, we wanted to get the most out of the experience, so we loaded up on activities, booking tours through the hotel for both mornings and afternoons. That was a mistake! During December, it’s not really light until about 11 a.m., and the sun starts to set around 3 p.m. When the sun goes down, the temperature plunges; you’ll want to be inside. Period. So do book your activities online with the hotel in advance but emphasize that you want the first tour of the day which typically leaves around 10 a.m. The activities offered at Kakslauttanten are truly unique… and are all an added expense. If you have young children, I’d recommend the two-hour reindeer safari. Your reindeer herder is a member of the Sami people, who are indigenous to Lapland. They wear traditional red and blue embroidered clothing with reindeer skin mittens and boots. Our guide was a charming fellow, who was eager to show us the Sami ways. He drove the reindeer-pulled train of sleds while we sat inside (two people per sled), bundled in extra blankets; you’ll need the body heat! We had plenty of time to admire the pink sky and snowy landscapes. After the ride, we headed back to his warming hut for a hot drink around the fire. This activity is very low key and is not especially enjoyable for older kids. Cost: Youth (2-11) $67; Adult $130. I would recommend the two-hour husky safaris, where you’ll have an opportunity to mush a team of dogs, but with two cautions. First, do this activity in the morning. Our afternoon tour got delayed because of some uncooperative huskies. By the time we left, it was dark. Some 20 minutes into the ride, my younger son lost all feeling in his feet, as he got very cold sitting in the sled alone, and we had to turn back. Secondly, the difficulty of mushing your team of dogs is dependent on just how fast the dogs are that you get. We had one extremely fast team that required my husband’s full weight to brake. The other team was much slower and manageable. Even so, I wouldn’t recommend that kids actually drive the sleds; it was a bit nerve-racking. Cost: Youth (2-11) $79; Adult $157. One of the more unique experiences was the nine-hour ice fishing safari. This tour involved snowmobiling across three frozen lakes, drilling holes in the ice and fishing (no bites), eating a salmon soup lunch around a fire (keep in mind, it’s -22° F), pulling up underwater fishing nets, and then returning on snowmobiles. To be honest, we wish that the tour had been shorter because of the extreme cold; it’s definitely not for young children. However it did provide an intriguing look at what it takes to live in the Arctic. The tour ended at an interesting (and indoor!) museum dedicated to the Sami people. Cost: Youth (2-11) $138; Adult $277. The three-hour Aurora hunting snowmobile safari is a little misleading. You don’t really hunt for the Northern Lights. You simply follow the snowmobile trail; if the lights are out, you’ll see them. If not, as was the case on our night, you’ll simply see a big starry sky. The snowmobiles can be a little hard to maneuver, especially if you’re riding double. The turning takes some muscling. The course was extremely bumpy; plus, you’re riding in the dark in an unfamiliar area. If you think that the ride will be relaxing, it’s not. But it’s actually worse for the passenger (your child), as it’s more difficult for him to keep warm. Take my advice, skip the night rides. 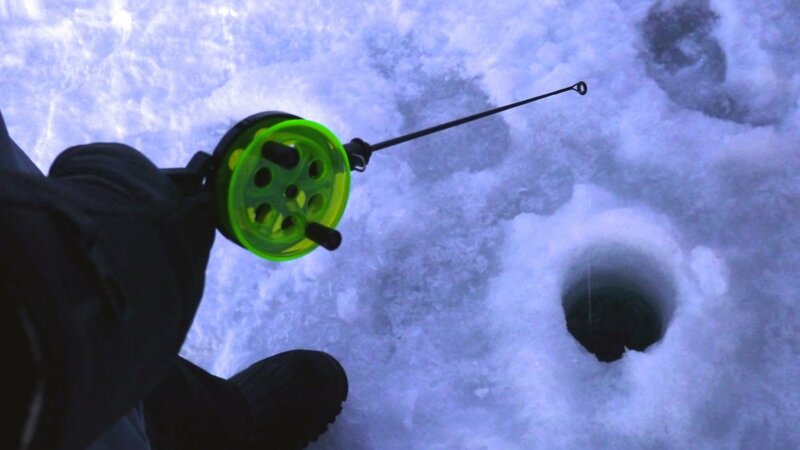 If you want to ride snowmobiles, go during the day or get your fill on the ice fishing expedition. Cost: Youth (2-11) $82; Adult $166. KidTripster Tip: You need to be 16-years old to drive a snowmobile. Honestly, riding without driving isn’t that fun for kids. Will you see the Northern Lights? Maybe. Aurora Borealis season is from late August through April, but the lights are unpredictable. During our four-night stay, we saw the Northern Lights once for about an hour on Christmas Eve. Yes, it was quite a gift. KidTripster Tip: The Northern Lights are spectacular but very difficult to photograph. Read up on it online before you come. When to go & how much? If you go over the Christmas holiday, you will pay a premium, but there are some added attractions, given that it’s Santa’s home turf! Skip the Christmas service held at West Village; it was uninspiring, to say the least. After the Christmas buffet, there’ll be a visit from Santa, complete with a sleigh and reindeer. That was special, especially for the younger children. KidTripster Tip: You can supply Santa with a gift earlier in the day to give your child that night. For the money, if I had to do it over again, I wouldn’t go during the holidays. During high season (mid-November through mid-March), the Kelo-glass igloo costs $805/night for two adults, plus an additional $258/child, plus an additional fee for half board at $40/night/adult and $23/night/child. At Christmastime, it’s $1347/night for two adults (with a mandatory 3-night stay), plus meals. Yes, expensive. To get to Kakslauttanen from the United States, you must first fly to Helsinki or Stockholm, where you’ll likely need to stay overnight. The next day, you’ll fly to Ivalo in northern Finland. You can then take a shuttle to the resort. KidTripster Tip: Connect through Helsinki on the way there and through Stockholm on the way home (or vice versa) with overnight stays in each. That way, you’ll get to visit two European capitals instead of one. Editor Shellie Bailey-Shah travels with her husband and two sons. She has tremendous respect for the Finns and Sami people, who live in one of the harshest climates on Earth. 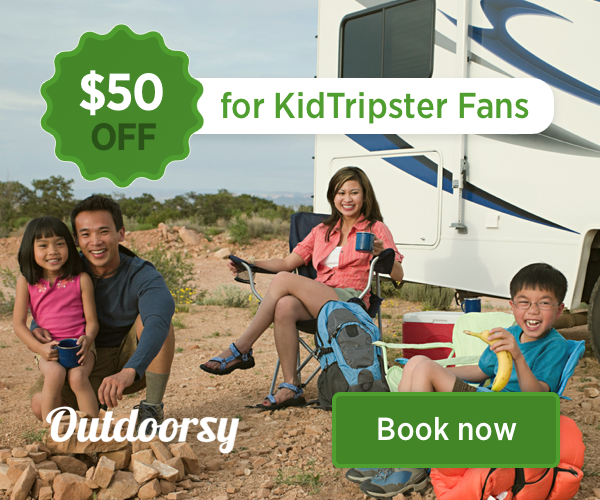 Amazon product links are provided for your convenience, and yes, KidTripster makes a few cents, too. You'll pay the same price as you would going to Amazon directly.